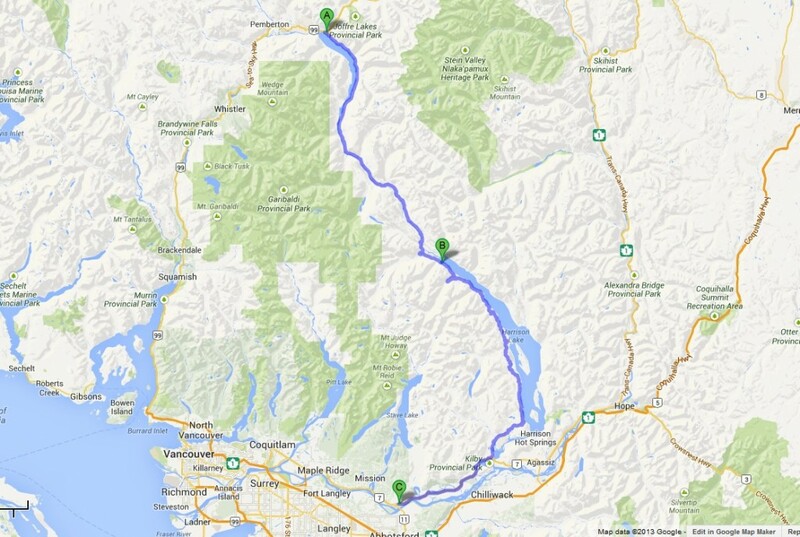 It starts just east of Pemberton and runs along Lillooet Lake. From there the logging road winds through the woods before connecting with the north end of Harrison Lake. Eventually it becomes Morris Valley Road and flows into Highway 7 east of Mission. The logging road is close to 200 kilometres of bumps, ruts, rocks and dust. It passes the odd quiet homestead, an isolated First Nation reserve, abandoned vehicles, logging camps and what was at one time to be Tipella City. This past Sunday, J and I along with his cousin set out from Highway 99 and headed south on the logging road. A little over half-way down that road, north of the Tipella air strip, a side road leads to what’s known as Sloquet Hot Springs. Don’t bother searching on Google Maps – Google has never even heard of them. 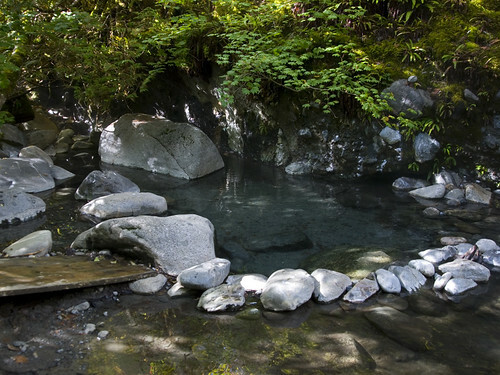 Seven small pools are heated naturally and nestled alongside a much cooler creek. 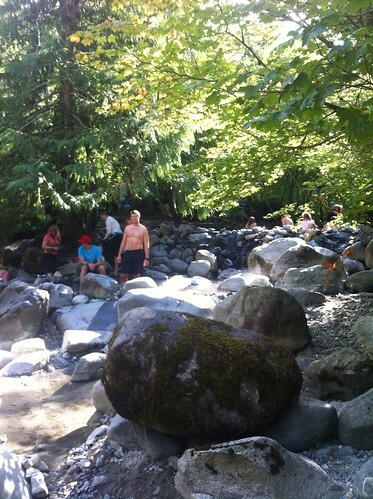 Surrounded by old growth forest, Sloquet Hot Springs is one of those British Columbia gems that few know about and even fewer visit. I was surprised to see some families and small groups when we arrived at the hot springs – I had expected them to be completely vacated. Several campsites are located at the top of the short trail descending to the hot springs, so it would appear that those who know, go. After drifting from pool to pool and lounging in the sensationally relaxing water for more than an hour, we made the long trip back to Vancouver. Next time we visit, we’ll shell out the $13 per night fee to camp there. We clocked close to 12 hours of driving time – a lot to complete in one day. Before you consider venturing to Sloquet Hot Springs, let me be honest: the drive was tedious, seemingly unending and pushed me close to breaking down into tears on a few occasions. Even Jordy fared better on the trip, sleeping for most of it. However, the hot springs were wonderful enough that they made me forget about the drive entirely. If you’re ready to make the trip yourself, visit Whistler Hiatus for more information on the hot springs and for driving directions. 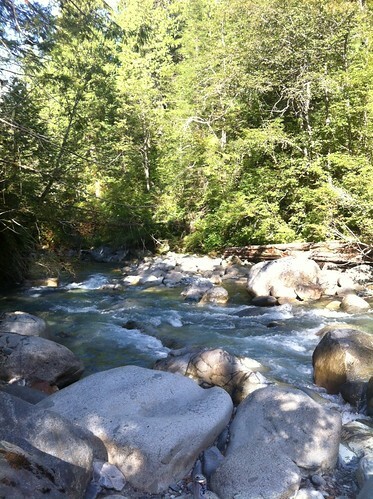 Avoid visiting when inclement weather is present as the logging road can experience wash-outs. Pack a map, lots of food and water and carry out any garbage you bring in with you. I noticed a lot left behind from other users. Most importantly, let someone know where you’re headed because it’s definitely off the map. K, I enjoyed reading this post, as I really like the discovery of hidden roads like this in one’s “backyard”. I admit I’m a little biased, because when I see that path you’ve marked out above with Google Maps, all I can think of is “photo opps”! Thanks again for your post! I would have loved to take photos, Henry. Believe me when I say that the road was far too bumpy for any kind of camera snaps!